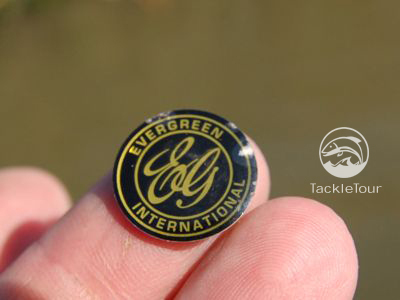 Introduction: Part of the fun of Enthusiast Level tackle is finding pieces that are no longer in production. 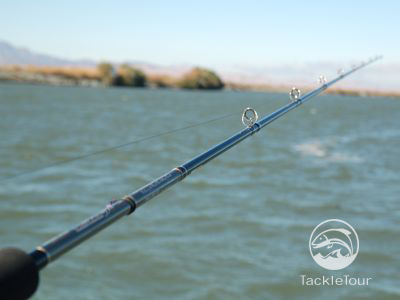 Even more fun is if you can find two pieces like a rod and reel to pair up with one another and build your own classic combo. Today we bring you one such combination with our pairing of the ZPI modified Abu Garcia Mörrum SX1601C AE74, and the legendary Evergreen International TMJC-68H Dengeki. Impressions: Sometimes the journey to acquire that which is somewhat rare and exclusive can lead to disappointment. Fortunately, with both the TMJC-68H Dengeki and Abu Mörrum SX1601C AE74, nothing could be further from the truth. Certainly the Dengeki is not as flashy or full of intricate details as a rod from Megabass or Gancraft, but that does not mean it does not have its own intrinsic appeal. Produced in 2000 for the MSRP of 64,000 JPY, the TMJC-68H is a thoroughly clean stick with very subtle nuances that can keep you mesmerized for days. 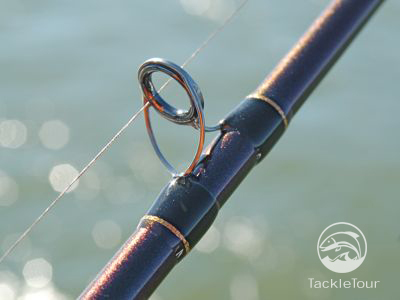 The finish on the first third or half of the rod from the reel seat up towards the tip demonstrates this case in point. It is finished with one of those color changing paints shifting hues from a deep green to a deep purple depending upon the combination of light and angle from which you view it, yet, look for the point at which this paint is no longer used, and you cannot find the edge. It is maddening and fascinating all at once. 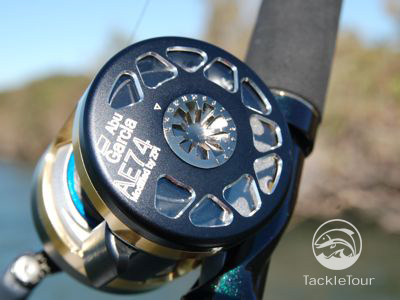 The AE74 is ZPI's take on an already magnificent little reel from Abu Garcia. In fact, why the Mörrum was ever discontinued from the factory is a mystery. 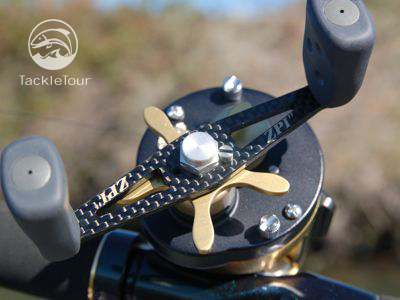 Nonetheless, ZPI's version of the Mörrum takes this reel to an entirely different level featuring, of course, ZPI's own custom built magnesium spool, SiC bearings, carbon handle, a new, lower stance thumbar, and a customized sideplate. 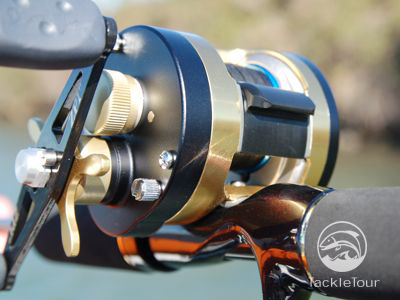 In short, this reel is SuperTTuned right out of the box! To the best of our knowledge it was produced in limited quantities from 2005 through 2007 and carried with it the original MSRP of roughly $850. Recent searches through a popular auction site in Japan showed one AE74 listing for 155,000 JPY! Lab Tests: We strapped our TMJC-68H Dengeki up to the RoD WRACK just to get an idea of where this stick compares to a few more easily a procured sticks. What we found was a stick that lives up to its "H" power rating and then some. 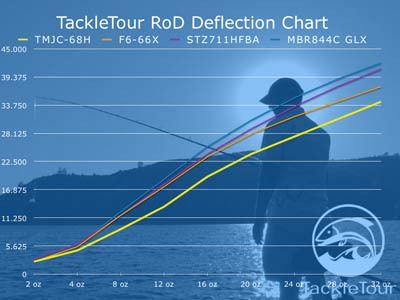 Rate of Deflection (RoD): On our RoD WRACK, the Dengeki is considerably more stout than our Daiwa Steez 711HFBA and G.Loomis MBR844C GLX and even out muscles our F5-66X Bearing Down. In hand, this plays out similarly as you can just feel the Dengeki has a bit more backbone than the other three while pressing its tip into the carpet on the boat. Fig. 1 : This RoD Deflection Chart shows the deflection characteristics of the Dengeki (yellow curve) against several similar sticks. Spine, Weight, and Balance Point: While the TMJC-68H may also be heavier than the other three sticks we pulled out for comparison's sake, it is also infinitely better balanced. But suppose you prefer lighter weight to balance? Well, with this stick, you can remove the rear counterweights and gain back those few precious ounces if such is your preference. Real World Test: I fished the Dengeki stock, leaving the supplied weights in place, but did add a Fuji EZ-Keeper hook hangar to make stowing the rod fully rigged up a bit easier to deal with. I lined the AE74, at first, with 14lb Fireline, but later tried both some Trilene 100% Fluorocarbon, and some Sunline Shooter Defier Mono. Abu Mörrum AE74 SX1601C .. 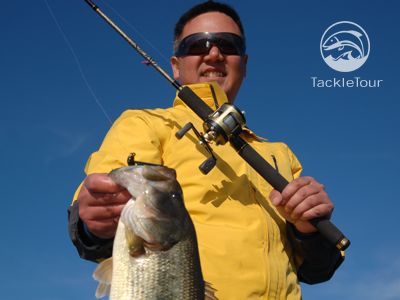 Pitching and Casting: The Dengeki lives up to its lure rating requiring at least three eighths of an ounce or more to properly load for a cast or pitch. I primarily fished jigs on the Dengeki, so the majority of my presentations were made with either pitches, or short roll casts. In combination, the AE74 and Dengeki make a fantastic jig fishing outfit. The AE74, specifically, fished all three lines we spooled on it very well though I seemed to enjoy the Defier on it the most. This slick monofilament from Sunline handles extremely well and made pitching and casting very fun with the AE74 specifically, but also a joy with this combo overall. Another upgrade in the AE74 over its standard Mörrum counterpart is the lower positioned thumbar - a sore point in our 2005 SuperCast Shootout specimen, but not an issue with this reel. Unfortunately, the AE74 is not the BEST reel to pair up with the Dengeki. I found this out after a professional overrun gone awry. Instead of fiddling with the AE74 to get it untangled, I swapped it out with a Daiwa Steez 103HL. 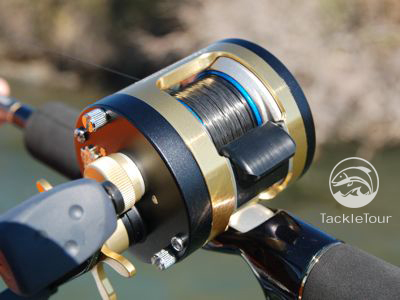 I noticed an immediate gain of about five to ten feet on every cast, and pitching was even easier with this reel mounted on the Dengeki - ouch. 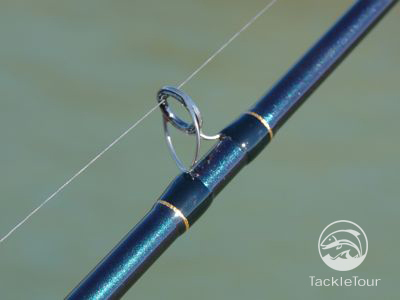 Sensitivity: The Dengeki is touted as possessing a super high tensioned blank that simulates the feeling you might get with a rod possessing titanium fibers in the blank. I must say, with claims such as this, I was expecting a lot from this stick and in the end, I didn't feel the hyper-sensitivity for which the rod is touted. Now, don't get me wrong, the Dengeki is a very sensitive stick and it transmits information very well through the blank, I once again was simply caught expecting more. 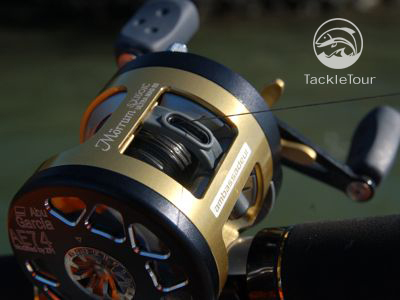 Drag & Retrieve: Back to the AE74, it's feel and performance in terms of drag and retrieve is right on par with the Abu Mörrum Ultra Mag S2 SX1601C I fished several years ago during our SuperCast Shootout of JDM Round Reels. In the lab, we tested out the AE74's drag to 7lbs max pressure but with some shuddering throughout the range down to about 2lbs on steady pulls. 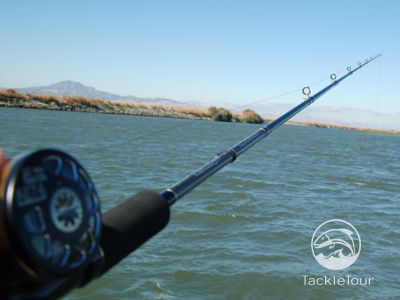 On the water, I never hooked into anything strong enough to really pull and test the AE74's drag consistently. Power: As we inferred from the stick's performance on our RoD WRACK, the Dengeki certainly lacks nothing in the power department. In fact, for how it feels in hand, it is deceptively powerful and really, pretty stiff. I was fishing a little outside the box with this rod tossing a Lucky Craft LV500Max on this stick and hooked into a nice four or five pound bass. 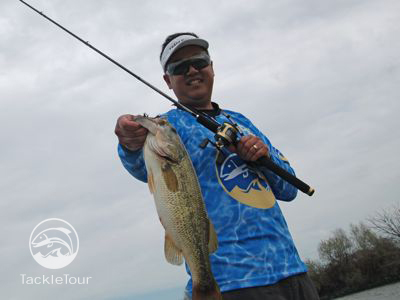 As I battled the overmatched fish to the side of the boat, it made one final attempt to get away with a surface run, opened its gaping mouth as it splashed on the surface, and I pulled the lipless crank right out of its mouth thanks to the unforgiving Dengeki's tip. I immediately cut the crankbait off and tied on another jig instead! 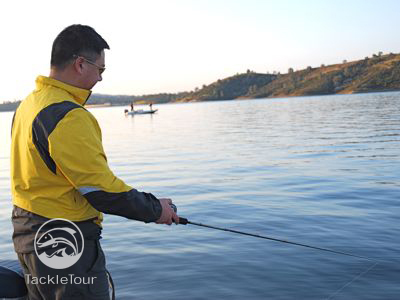 Application: The rod has written under its name "Rubber Jig and Hard Slow Rolling Special" inferring that it might be suitable for large spinnerbaits. I'm not sure I could fish a spinnerbait very effectively on this stick, but I can say it makes a wonderful jig rod. In fact, it is my go-to jig rod at the moment despite my slight disappointment with the rod's sensitivity, and I'm sure it'd suit equally well with just about any bait or technique that requires a slow, vertical-type presentation. Notice how the blank in the previous picture appeared purple? Here, from a different angle, it appears green. 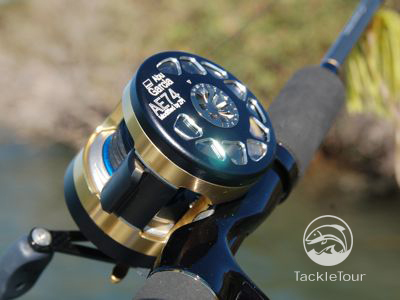 As for the AE74, this reel's specialty is in pitching jigs and soft plastics. 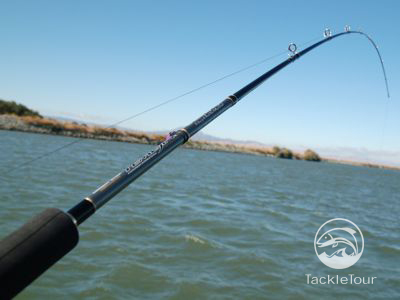 That is why I matched it up with this rod and why I will continue to use it, almost exclusively with this stick. Despite the fact the Steez performed better overall with the Dengeki, the AE74 is such a classic, it's hard to separate it from my Dengeki. I suppose this can be expected in a rod that is at least eight years old. The badge on the back of my Dengeki just fell off one day. Warranty: If you're lucky enough to find either or both of these products, warranty should be the least of your concerns for with both items out of production and built for the Japanese Domestic Market, well, even if you did find them new once, the likelihood of finding an exact replacement through warranty should something go awry is very very slim. Conclusion: So ends our journey with this classic combo. Were these pieces still in production and ratings were appropriate, I'm sure they'd have both scored fairly highly and they certainly would have each received an Ultimate Enthusiast Award. My previous experiences with Evergreen sticks were all met with a bit of disappointment, not quite living up to what I thought a stick from this well respected manufacturer should be. One of my favorites, the Balista, was close, but still not quite there because of its moderate nature. 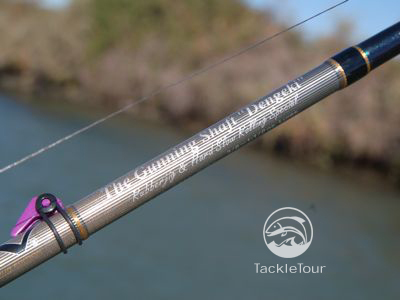 The Dengeki is about everything I had ever hoped for in experiencing what Evergreen International has to offer in a fishing rod which means I just might have to put its replacement, the TMJC-610H Gunslinger, on my list of "must acquire" rods. The AE74 is one of those pieces that you look at every time you pick up and think "I can't believe I managed to get one of these reels". 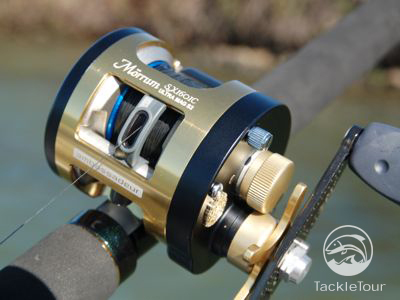 Even in its non-ZPI'd state, the Mörrum reels from Abu are simply solid little reels and they were available long before the word "Revo" ever made its way through corporate headquarters. 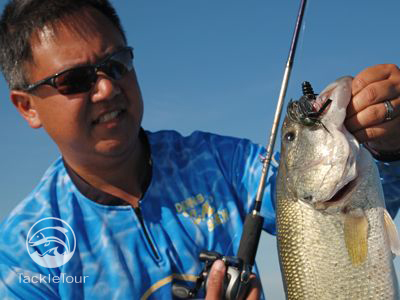 One can only hope that Abu takes a look back, at some point in time, to move forward and brings the Mörrum back to compete with the likes of Shimano Conquest/Calcutta and Daiwa Millionaire/Luna. Throw in the ZPI upgrades and there really is only one word to describe the AE74 - sick. Though I'm not sure anyone should be sick enough to fork over 155,000 JPY to purchase one of these beauties, if one comes within your grasp, my recommendation is to not hesitate, make the purchase, and covet this little gem as among the most exclusive in your collection.